Since 1928, when Mickey Mouse made his film debut, Disney has continued year after year to entertain us with wonderfully touching stories filled with the most captivating characters. 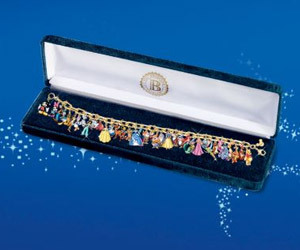 Now, she can relive the magic with this Disney charm bracelet, available from The Bradford Exchange and featuring an incredible 37 individual unique Disney character charms. The fully sculpted and brightly colored charms faithfully capture the beloved animation art of Disney artists, from Mickey Mouse and Minnie Mouse to Winnie the Pooh and Tigger. This attractive 24K-gold plated link charm bracelet is adjustable up to 8″ long and finished with a matching locking clasp and a hallmark tag in the shape of Mickey Mouse ears. As a finishing touch, this Ultimate Disney Classic Charm Bracelet is beautifully presented in a custom-crafted presentation case, creating the perfect Disney Mother’s Day gift. Don’t wait, strong demand is expected in this gift-giving season, so order now!